But she really spent more time just talking about her experience. Someone asked her what she noticed as the largest contrast between Lagos and the US. “Fast internet!” she said. The internet in Lagos is slow, and when she returns to the US, one of the first things she does is go online. Having gotten accustomed to that, she becomes impatient with the poor speeds of the Nigerian connections. “How about electricity?” someone else asked. Nigeria, like many developing countries, has power shortages. “You’re different in Lagos,” a visiting friend told her. “You’re loud.” She laughed and said she needed to be, in Nigeria. 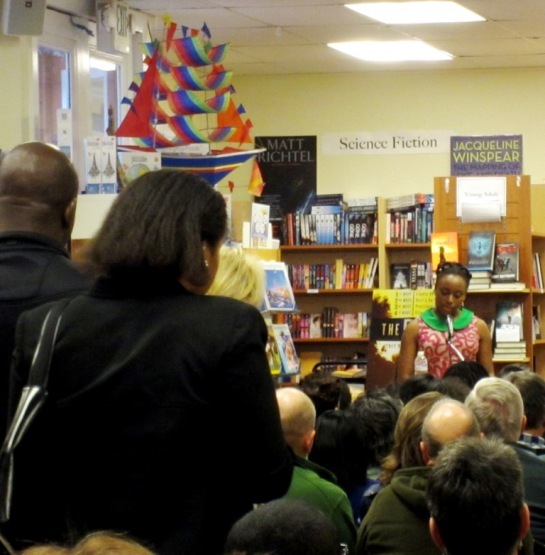 “When I get off the plane in Lagos, I become my Nigerian self,” she explained to the audience. Everything she said resonated with me, from the power shortages, to the loudness, to the local resentment against people who return from a few years of living in the West and then find fault with Lagos because it isn’t London. That’s exactly how I feel when I go to India. On a superficial level, it’s the slow internet, the need for a generator, the disorderly traffic, the plethora of little shops and colorful clothes and butterflies and untamed urban wildness. But there’s a deeper sense of knowing and comfort with the world that I don’t get visiting other countries, even ones I’ve lived in, of being inside and outside the culture at the same time. It’s code-switching, barely conscious. I expect different things of people, of the environment, of objects. It’s another world. Someone offered me an interesting analogy: Each country or culture comes with a different User Manual. That’s what you need to pull out, learn, update. I have to say I feel privileged to have access to multiple user manuals – even if it makes me a master of none.